Democrats Abroad Guatemala will hold its in-person voting for the Democrats Abroad Global Primary on Tuesday, March 1, 2016 at Café Condesa, on Central Park, in Antigua Guatemala, from 8:30 am until 6:00 pm. March 1, 2016, is Super Tuesday, which in the United States, in general, refers to the Tuesday of the primary season in a presidential election year when the greatest number of states hold primary elections to select delegates to national conventions at which each party's presidential candidates are officially nominated. More delegates can be won on Super Tuesday than on any other single day of the primary calendar and candidates must do well on this day to secure their party's nomination. All members of Democrats Abroad Guatemala are encouraged to vote in the Democrats Abroad Global Primary, rather than in the primary of their voting state back home. 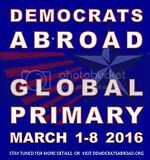 That is, you may vote legally in only one primary, so make a point of voting in Democrats Abroad's Global Primary. For Democrats Abroad Guatemala members who cannot vote in-person on March 1st, remote voting by surface mail, fax and email is available. Request your ballot at: www.democratsabroad.org/gpp, or mayadems@yahoo.com. Direct any additional questions to: mayadems@yahoo.com.